IBC, Inc. developed the concept and process design for the Municipal Solid Waste Treatment Plant in Saida, Lebanon. This is the first project in the world to include all technologies under one roof to separate and treat Municipal Solid Waste. Click here to learn about this unique project. What is meant by Waste Management? Basically, it involves the storage, collection, transport, separation, treatment and disposal of waste material - this covers the entire waste cycle. A significant aspect of this cycle is human attitude towards and waste consumption; awareness is key. Waste material can involve solid, liquid or gaseous wastes, with each having specific methods to manage throughtout and in every stage in the waste cycle. Click here to see a bird's eye view of Waste Management. 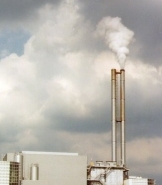 IBC, Inc. provides environmental solutions in the areas of Municipal Solid Waste Management (MSW) and Wastewater, in addition to the treatment of Hospital, Hazardous & Slaughterhouse Waste. IBC, Inc. services range from setting environmental strategies & community awareness programs, to the implementation and project management of a complete Municipal Solid Waste (MSW) Management plant. By applying Integrated Resource and Energy Concept, IBC, Inc. combines multiple technologies & processes under one roof and has executed the process design for the Municipal Solid waste Treatment Center in Saida, Lebanon. Management of MSW is one of the major problems facing urban cities. Old methods of land and incineration are being abandoned due to their negative impact on the environment. 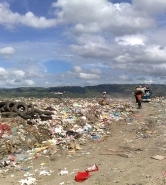 Landfill contributes to the condemnation of land, production of leacheates, emmissions, carbon dioxide and pollutant gas. IBC, Inc. provides a total solution for MSW and sponsors projects that manage the MSW in their components. Organic components are treated biologically via anaerobic bio-conversion. Other non-organic components such as plastic, paper, glass and metals are recycled to be made useful in the civil community. 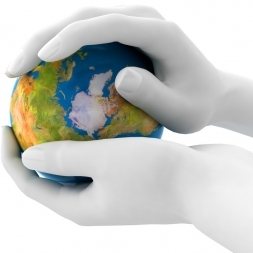 The aim of IBC is to reach a point of ‘almost zero landfill’! This requires tremendous efforts and community outreach to happen. In addition to the biodegradation of the organic matter coming from MSW, IBC encourages the biodegradation of sludge originating from wastewater treatment. This solves the problem of many cities that produce sludge that is not allowed to used without undertaking an expensive 5-year treatment. Click here to learn more about IBC INC.'s MSW solutions. No Odor It is important that the management of MSW must not emit any odor. The management is done in a closed atmosphere with Biofilters that change the air in the plant three times an hour. No Incineration The Anaerobic Bio-conversion process treats all organic components, while the inorganic matter is sorted for recycling. Hence, there is no organic component to be incinerated which would leave negative impacts on the environment. No Sanitary Landfill Non-organic components are recycled into raw material or used as fillers in industrial development for re-use of such component.